Below is an array of 12 longitudinal slices through the egg cylinder of a rat on E10. The embryo is cut first on the left side (slice 3), through the midline area, and then on the right side, finishing with slice 69. 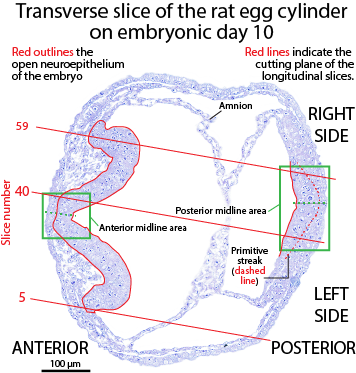 The picture to the right shows the approximate orientation of the longitudinal cuts on a transverse slice of another E10 embryo. The slices are angled (red lines) so that the anterior end is heading inward toward the right side, while the posterior part of the slice is heading outward toward the left side. The green rectangles indicate the regions of the longitudinal slices that appear to be in the midline area. The green dashed line in each box is the actual midline. The midline is always easy to spot in transverse slices—not so in longitudinal slices. Notice that the midline is offset between anterior and posterior sides. That is because the midline is never a straight line; it always tilts and bends. The midline is set during the process of gastrulation when mesodermal cells move inward in the center of the primitive streak. The neuroepithelium (outlined in red) is composed of columnar mitotic cells that will form all of the cells specific to the nervous system. These include nerve cells (neurons) and their supporting cells, glia. On E10 the neuroepithelium is completely open and forms a prominent U-shaped structure composed of columnar cells on the dorsal (upper) surface of the embryo. The neuroepithelium in the anterior part of the embryo forms a curved hump, the head folds of the future brain. The neuroepithelium in the posterior part of the embryo is a narrower plate, the future spinal cord. There is no neural tube or somites (discrete boxes of mesoderm on either side of the posterior brain and spinal cord). At this stage of its development, the neuroepithelium of the central nervous system is the most prominent structure in the developing rat head and body. Embryologists often refer to the entire embryo as a “neurula.” That early prominence is in line with the major role played by the nervous system throughout the entire life of the animal to direct all bodily functions and behavior.